Sangha is a word in the Pali language that means "association" or "assembly." The Sanskrit equivalent is samgha. In early Buddhism, sangha referred to the community of all Buddhists, both ordained and laypeople. This was sometimes called the "fourfold assembly" -- monks, nuns, laywomen, laymen. 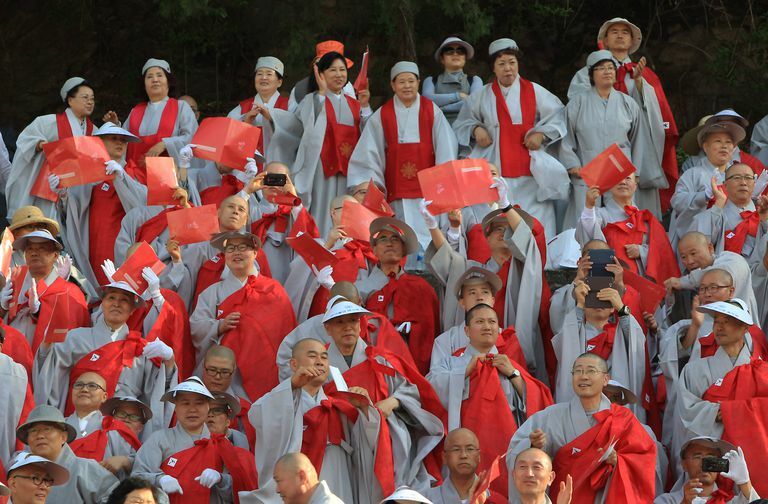 In most of Asian Buddhism, sangha came to refer primarily to ordained nuns and monks. In the English-speaking West, however, it might refer to all Buddhists past, present and future, or to the living members of one small Buddhist center, both lay and ordained. Note that this is similar to how Christians sometimes use the word "church" -- it might mean all of Christianity, or it might mean a particular denomination, or it might mean just one congregation. The meaning depends on context. In early scriptures, sangha referred to the assembly of women and men who had attained at least the first stage of enlightenment, a milestone called "stream-entry." "Stream-entry" is a bit difficult to define. You can find explanations from the "first experience of supermundane consciousness" to the "point at which all eight parts of the Eightfold Path come together." For purposes of our definition, let's say this would be someone who is entirely committed to the Buddhist path and who is actively part of a Buddhist community. Probably the oldest ritual of Buddhism is that of Taking Refuge. The oldest scriptures indicate that this goes back to the time of the Buddha. Together, Buddha, dharma, and sangha are the Three Jewels or Three Treasures. For more about what this means, see also Taking Refuge in Buddha and Taking Refuge in Dharma. Independent-minded westerners who take an interest in Buddhism sometimes balk at joining a sangha. Certainly, there is value in a solo meditation and study practice. But I have come to see sangha as just as important, for two primary reasons. First, practicing with a sangha is invaluable for teaching you that your practice isn't just about you. It is invaluable for breaking down the barriers of the ego. The Buddhist path is a process of recognizing the essential unreality of the self. And an important part of spiritual maturity in the dharma is recognizing that your practice is for the benefit of everyone, because ultimately self-and-other are not two. In his book The Heart of the Buddha's Teaching,Thich Nhat Hanh said that "practicing with a Sangha is essential. ... Building a Sangha, supporting a Sangha, being with a Sangha, receiving the support and guidance of a Sangha is the practice." The second reason is that the Buddhist path is a path of giving as well as receiving. Your participation in the sangha is a way of giving back to the dharma. This becomes more precious to you as time goes on. It's believed the first monastic sangha was formed by the nuns and monks who followed the historical Buddha. Following the Buddha's death, it is believed the disciples organized themselves under the leadership of Maha Kasyapa. Today's monastic sangha is governed by the Vinaya-pitaka, the rules of the monastic orders. Ordination according to one of the three canonical versions of the Vinaya is considered necessary for inclusion in the monastic sangha. In other words, people cannot self-declare themselves to be monastic and expect to be recognized as such.